Democrat Kevin Mullin currently represents Assembly District 22 and will not be termed out until 2024. Mullin is expected to easily win re-election in 2016. Kevin Mullin, a former city councilmember and mayor of South San Francisco, a local business owner, and former state legislative aide was elected in November 2012 to represent the 22nd Assembly District. 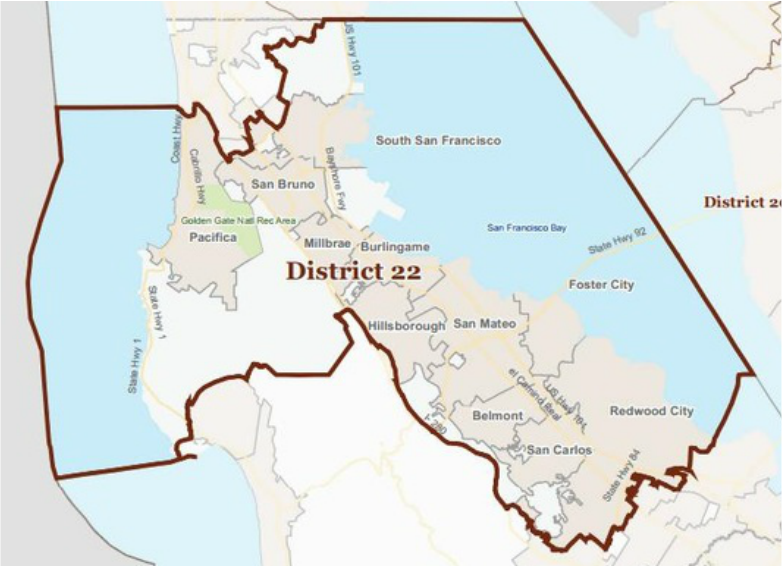 The district includes the cities of Belmont, Brisbane, Burlingame, Foster City, Hillsborough, Millbrae, Pacifica, Redwood City, San Bruno, San Carlos, San Mateo and portions of South San Francisco. Kevin's roots run deep in San Mateo County. He attended public and Catholic elementary schools, graduated from Junipero Serra High School, received a bachelor's degree in Communications from the University of San Francisco, and a master's degree in public administration (M.P.A.) from San Francisco State University. Additionally, Mullin completed an executive leadership program at Harvard University's Kennedy School of Government. Kevin was elected in 2007 to the South San Francisco City Council, and served as mayor in 2011. He was re-elected in 2011. Mullin also represented the cities of San Mateo County on the Metropolitan Transportation Commission. He previously served as district director for then-State Senator Jackie Speier (now Congresswoman) and as political director for his father, former State Assemblymember Gene Mullin. As an entrepreneur, Kevin created KM2 Communications—a multimedia production business in South San Francisco. He produced public affairs programming seen on local television and hosted various programs seen on Peninsula-TV Channel 26. Assemblymember Mullin was named Assistant Speaker pro-Tempore by Assembly Speaker John Perez. In this capacity, he will preside over the Assembly floor session as needed. His legislative priorities will be to promote job creation, enhance education and workforce development systems, encourage environmentally sustainable regional planning and work in a bipartisan way to reform state governance. Kevin serves on the following committees: Budget, Budget Subcommittee #4 on State Administration, Business and Professions, Local Government, Utilities and Commerce, and Revenue and Taxation. Kevin lives in South San Francisco with his wife, Jessica Stanfill Mullin, and their beagle, Sunshine.